So I started this challenge with a bang....and then went off the rails...I made a freestyle cowl....then joined another KAL, and downloaded a new sock pattern....but today went back on the wagon...knitted on my Stepping Stones from the book...added another inch and started the heel flap...WOWZA, is this heel flap gonna be thick!!! How about your library this week? The Secret Keeper sounds good!! Ugh, I have been meaning to knit socks all month and so far have only knit like an inch of one! I'm off the rails already too but you're not! The weather got gorgeous here and I was out the door...hiking, cleaning the garage...I have to take advantage of it as it won't last long. The socks look and sound wonderful. I have RA so a "cushy" sock would be right up my alley along with the Dr.Scholl's gel inserts! LOL! I was very tempted to join several C/KAL's but alas you see how it is when you're retired....you rebel against any type of deadline or structure! LOL! I'll report back next week as I needed to catch up with my preemie hats, and finally got those bookmarks blocked this morning. Love your Seahawk yarn...did you watch the game? Unbelievable!!! The brown is such a gorgeous brown...LOVE! I have never read Kate Morton but I will now! I hope you enjoyed your long weekend...looks like you did! The socks do look "thick", but that just means they will wear well! Hoping things calm down this week and I get around to everyone's blogs. My blog reader was so full I just had to mark all read and start over with this week's blogs. You are so busy. I feel tired. I love those socks, and love the colour! They look like socks my hubby needs. With work boots, he wears out socks very quickly. Oh, I think Rios would make awesome socks! Plus, they must knit up so fast! What kind of yarn is your Seahawk yarn?? 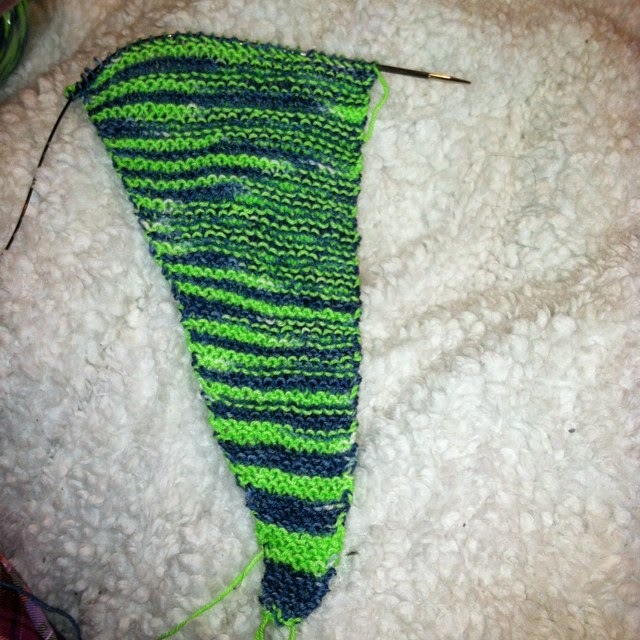 I'm a fan too and am totally on the look out for awesome Seahawk yarn to make gifts for my family!